The Fairtrade Access Fund was started with the cooperation and support of Fairtrade International, Grameen Foundation USA, KfW and Incofin cvso. The Fund’s objective is to contribute to the development of fair and sustainable agriculture sectors by addressing the financial and operational needs of smallholder farmers, agri-SMEs and agri-focused financial institutions. Since FAF’s inception in 2012, it has disbursed more than USD 184 million through 196 investments. The Fund has impacted the lives of more than 254,000 smallholder farmers and 51 investees in 18 countries throughout Africa and Latin America, with specialties in 11 different crop types. Approximately 55,000 end women clients have been serviced, 240,000 hectares of land sustainably cultivated and 2,600 smallholder farmers trained on good agricultural practices. With the FAF Technical Assistance Facility (TAF), 54,181 smallholder farmers have been reached throughout 10 different countries. The TAF aims to address challenges related to agricultural finance by mobilizing grant funding to provide the technical support necessary to improve productivity, reduce diseases and increase market accessibility. As a long-term investor, AgriFI will invest EUR 5 million in Class A equity to support the Fund, currently USD 51 million in size. The additional contribution will expand the Fund’s capabilities to meet the short and medium term financing needs of smallholder farmers. AgriFI, the Agriculture Financing Initiative, is an impact investment facility funded by the EU, with a mandate to unlock, accelerate and leverage investments with a value chain approach in developing countries, focusing on smallholder’s inclusiveness and/or agri-business medium, small and micro enterprises (MSME). 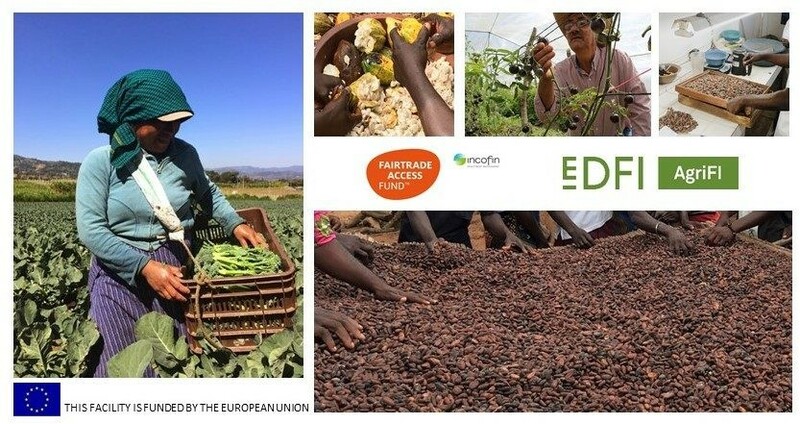 AgriFI is managed by EDFI Management Company NV in close association with the 15 European Development Finance Institutions (EDFI) as well as many other like-minded investors. Find out more on www.agrifi.eu and www.edfi.eu. The Fairtrade Access Fund (FAF), founded in 2012, is an open ended debt fund advised by Incofin Investment Management. The Fund focuses on delivering strong social and environmental impact and is the first fully self-sustaining agri-focused fund. FAF addresses the financial needs of smallholder farmers by bridging the gap in pre-harvest financing needs and by providing long term financing with the aim to contribute to financing investments. Impact objectives include but are not limited to improving the livelihood of over 500,000 smallholder farmers, generating over 10,000 permanent jobs, supporting over 2 million hectares of sustainably cultivated land and disbursing over USD 320 million (equivalent to >530 loans). The FAF team is also committed to developing the overall portfolio to reach USD 80 million in 2022, including increasing the African portfolio to reach a net growth >USD 10 million. For more information please visit incofinfaf.com.